Bandits approach a mountain village, but their chief decides to spare it until after the harvest because they had raided it before. The plan is overheard by a farmer. Three farmers ask Gisaku, the village elder and miller, for advice. He declares they should hire samurai to defend the village. Since they have no money, Gisaku tells them to find hungry samurai. 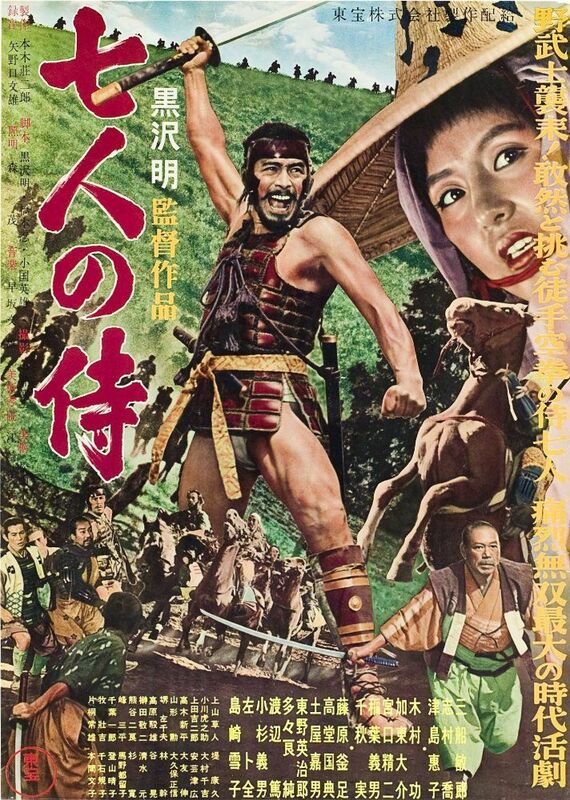 After little success, the group watch Kambei, an aging but experienced rōnin, rescue a young boy who had been taken hostage by a thief. A young samurai named Katsushirō asks to become Kambei's disciple. The villagers then ask for help, and after initial reluctance, Kambei agrees. He recruits old friend Shichirōji and, with Katsushirō's assistance, three other samurai: the friendly, wily Gorobei; the good-willed Heihachi; and Kyūzō, a taciturn master swordsman whom Katsushirō regards with awe. Although inexperienced, Katsushirō is selected because time is short. Kikuchiyo, a man who carries a family scroll that he claims makes him a samurai, follows the group despite attempts to drive him away. Read more on Wikipedia.